There have been so many great projects this week using the Epiphany Crafts Epoxy Tools! I love them all! For my designs, I decided on traditional Simple Stories layouts using the Handmade Holiday Elements and the varous 12x12 page protectors. My second set of pages are all about Christmas morning. Here is where I added in the fun oval epoxy shapes from Epiphany Crafts! I created buttons with initials for each of my kids on Christmas morning. I love the little extra touch and dimension they add to my traditionally "flat" layout! So fun! I have to say that I had never used these tools before now, but I'm a huge fan! They were simple, quick and fun to create with.... I have a wish list started of all the shapes I must have now! Fabulous! Time to start wrapping those gifts! Why not keep it "simple" and create gift wrapped items that can be used again? I used the Handmade Holiday Collection to cover these boxes and bag in a way that they can be easily opened with out ripping the paper. Then I used the Epiphany Crafts Shape Studio and Charms to make permanent gift tags that can be used for many future holidays. For the larger box (found at target), I covered the bottom of the box with the Handmade Holiday mistletoe patterned paper #2709 and left the lid alone since it was already a beautiful red color. For the permanent gift tag, I chose a 4 x 6 journal card from the Handmade Holiday Collection with a plain background and used my typewriter to add the gift recipient's name, but one could easily hand write a name as well - just make sure it will fit in a 1" cirlce. 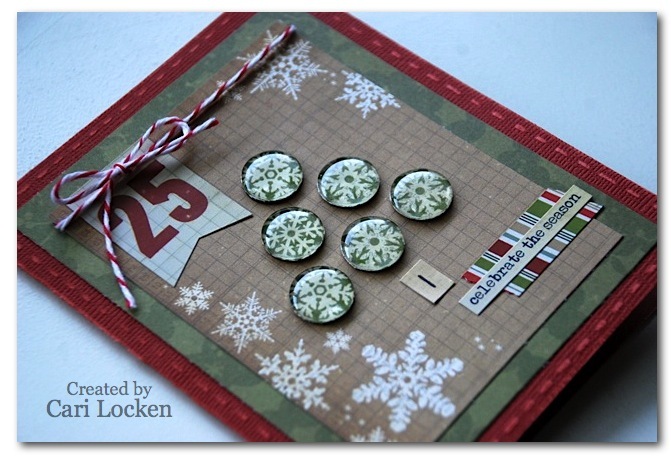 Then I used the Epiphany Crafts Round 25 Shape Studio and Bubble Caps to punch out the name. Finally I added the Bubble Cap to the Round 25 Charm Setting. Voila - a simple reusable gift tag charm that dresses up any gift wrapping. For the smaller box, which has a lid that folds up, I wrapped a strip of the Handcrafted patterned paper #2707 around the edge of the box and then cut a 3 x 3 inch square to adhere to the fold up lid. 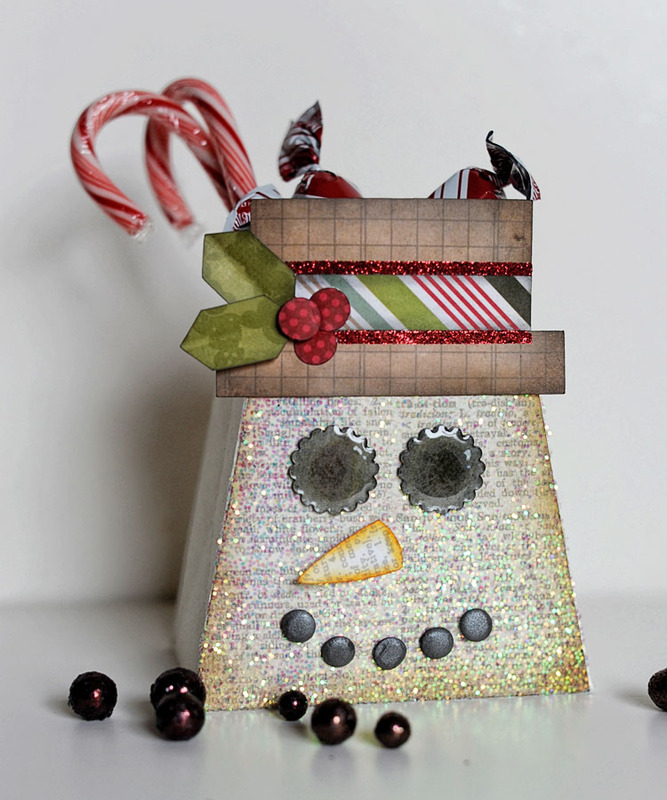 I used my scissors to curl small strips of a contrasting patterned paper and then used some foam tape to add the fun snowman sticker. Finally I tied on the reusable gift tag charm. For the kraft colored gift bag, I kept it simple and used some patterned paper and the scalloped cardstock sticker trim from the 12 x 12 Fundamental Cardstock Stickers. The beautiful tag is actually a cardstock from the collection. Then, of course, I tied on one of the Epiphany Crafts gift tag charms. Simple Stories and Epiphany Crafts will be giving away prizes at the end of the week! Leave a comment here on our Simple Stories blog and like our facebook page for your chance to win a Simple Stories prize Pack! Also visit the Epiphany Crafts blog for a chance to win! Leave a comment and like the Ephiphany Crafts facebook page and you might just be a lucky winner of an Epiphany Crafts prize pack! Simple Stories and Epiphany Crafts team up again today to share some amazing inspiration and ideas using our Simple Stories collections and Epiphany Crafts Tools! I also used these Metal Charms Double Square 25 and the Sn@p 6x6 pad to make this simple necklace for Jenna. At this point, Jenna came into my craftroom and decided she would like to make a set of magnets to use on her desk at school. Next thing you know, she had made this set! She was so proud of her tin, and thought it would make a great gift for friends. Thanks for the opportunity to play with the Epiphany square tool! Then use one of the Bubble Caps in the same shape and place it over the image you want to use and press down to adhere it. Then close the cap and push down. That's it! You can push the back to remove the bubble which is now adhered to the punched shape. And finally adhere to your charm! The little charms look like perfect little tree ornaments! I had so much fun trimming my tree with Epiphany! When I received some of the Epiphany Crafts Bubble Caps I knew right away that I was going to create some cards with them. They were the perfect shape for the ideas that I wanted to create on my cards. 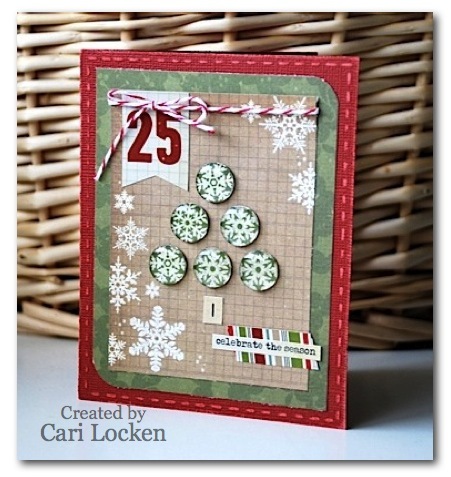 My 1st card, "Celebrate the Season", I decided to make a Christmas Tree shape/design using the Epiphany Bubble Caps. I used 5 of them and staggered them into a triangular shape. I then used the 'i' alphabet sticker from Simple Stories Handmade Holiday collection along with a few other stickers to embellish the front of the card. It's a very simple design to keep your eyes drawn to the tree feature. 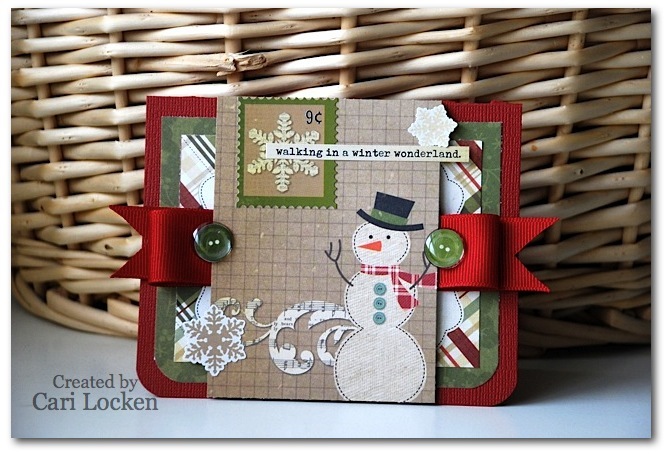 My 2nd card, "Walking in a Winter Wonderland", is again a simple design. I wanted to use the button stickers from the Simple Stories Handmade Holiday sticker collection along with the Epiphany Bubble Caps. They make the stickers look so glossy and raised up - looking like real buttons almost. I created my card with some stickers, patterned papers & ribbon. Then finished it off by adding the button stickers with the Ephiphany Bubble Caps. Super easy & super cute! I hope you have been enjoying all of the projects that the Simple Stories and Epiphany design teams have been sharing with you. Guiseppa here, to share with you a couple of cards I made these cards using Simple Stories Handmade Handmade Holiday Collection and Harvest Lane Collection. 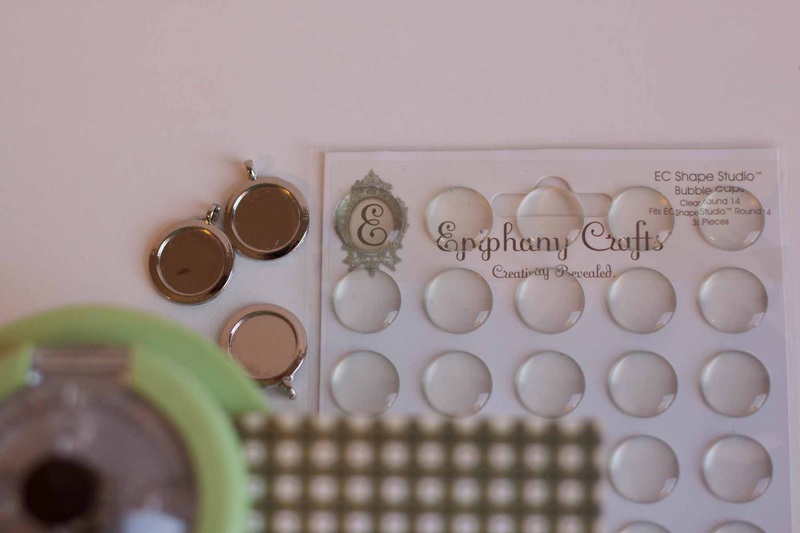 Epiphany's Shape Studio Oval 25, Bubble Caps Oval 25 and Metal Settings Oval 25. As you can see I made the Metal Settings my main focus on both of the cards. I cut this card out with the help of my Silhouette and hung the metal charm in the center using a jump ring an eyelet. I used my Silhouette for this card as well and centered the metal charm in the center, but wait...this card has a surprise. It opens up! I used some velcrow to help keep the card shut. I loved using Epiphany charms to help give my cards that extra special touch. Baubles and fobs...so many looks can be created with Epiphany products! 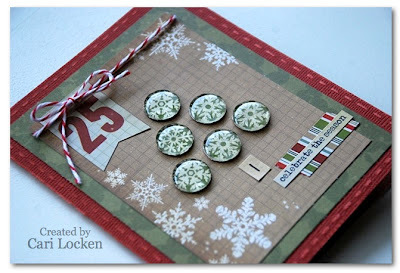 Shellye here with my portion of today's blog hop: a quick and easy Holiday Key Fob and Winter Layout. 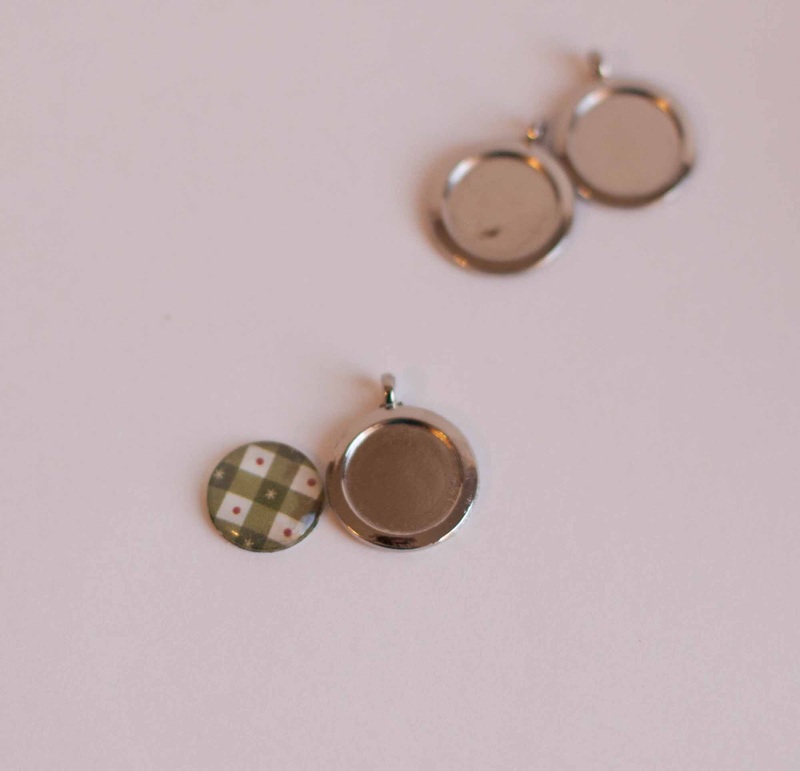 Both projects have included Simple Stories' Handmade Holiday Collection and Epiphany's Round 25 Punch Tool, Bubble Caps and Round Metal Charms. Not only can you dress up a keychain to celebrate the season, but also a necklace, bracelet or work badge. For mine, I used the snowman image from the 6x6 Handmade Holidays Paper Pad, the Round Tool, Bubble Cap and Round Charm (all in size 25). I attached the Bubble Cap to the Metal Charm with a permanent and high-tack Glue-Dot. Slip onto a small ring, tie on a little ribbon and attach to a key-ring. For my layout, I wanted to keep things neutral and non-Christmas as this photo was taken in January. I used the same Bubble Caps and Tool for this project. Simple Stories' Tis The Season paper from Handmade Holiday has the perfect sized round snowflakes to match the Round 25 Punch Tool! I punched out three different snowflakes and topped each with a Bubble Dome. I knew that I wanted to use the felt snowflakes that I found at Hobby Lobby, but the Bubbles seemed to get lost. So, I punched three 1.5" circles from Red Dot/Santa's List paper, attached them to the felt with a dab of fabric glue and then stitched an X over the tops with crochet thread. Using two squares of foam dots, I attached the Bubble Snowflake to the Red Dot paper. A medium sized pearl adhesive was added to the center of each Bubble Snowflake. In keeping with the round, lacy theme of the layout, I used a doily die-cut (by MFTStamps.com) to make a background for each of the felt snowflakes. Because I used the Green Holly/Notebook paper, I was able to use one of the doily shapes for a journal spot! 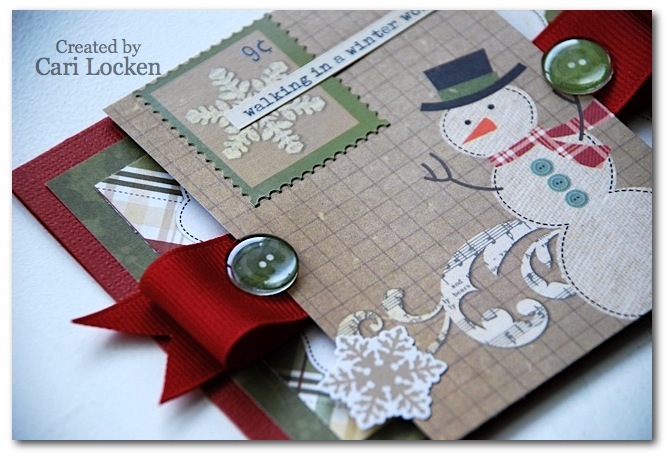 Layers of Handmade Holiday papers, a sticker border and snowflake stickers completed the clean-and-simple page! Epiphany products are so original and fun to use in any of your scrapbooking or papercrafting projects! Pair them with Simple Stories Handmade Holiday and you've got a cute, fun and original gift or holiday decor! 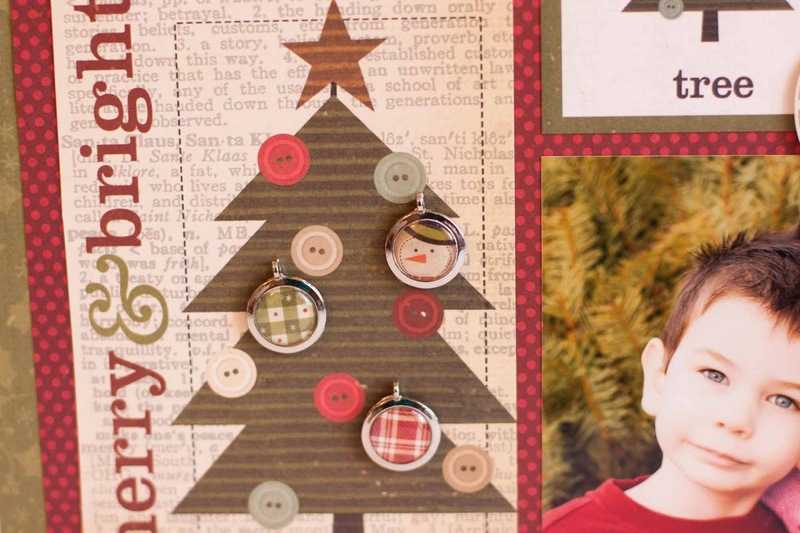 Today Donna shows us how using these three Epiphany Crafts products and our Simple Stories Handmade Holiday Collection! The Custom Square Shape Making Tool, Metal Charms, and the corresponding square Bubble Caps are perfect for this project. Last year my boys took their very first photo with Santa, and with our photo purchase we received some rather inexpensive keychains and miniature photos as a bonus gift. Rather than use it for its original purpose, I decided to use the keychain to create a photo ornament. I simply removed the large jump ring and will put a hook in its place instead. I used paper from the Handmade Holiday 6x6 paper pad, stickers from the Expression Cardstock sheet, and the Epiphany Crafts products to create this cute little charm to embellish my otherwise very simple ornament. Since the ornament is double-sided I decided to decorate the back too and included the year the photo was taken. And guess what? The charms are double-sided too! That's something I didn't notice right away, but it is a very cool feature since you can then decorate both sides of your charms. Using the tools and accessories from Epiphany Crafts was effortless and they made the perfect finishing touch to this quick and easy project. I am so happy to now have this keepsake of last year's visit to Santa! 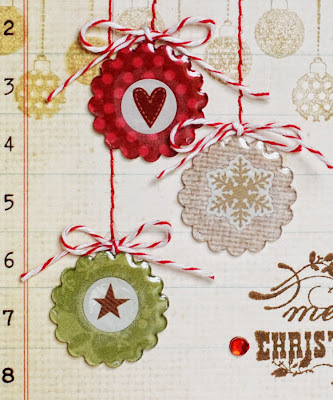 Our December Daily Blog Hop was a HUGE success! A great big THANK YOU to our design team members who created such wonderful inspiring December Daily albums and projects! AND - a huge THANK YOU to all of you who participated in our blog hop and left comments we love our Simple Stories customers! Today we are announcing our 3 winners! Our winners were chosen from comments made on our Simple Stories blog and from a random draw of comments left on design team members blogs! CONGRATULATIONS go to! Oh I'm excited to see this hop! THANKS! I love the folders you've made. Nice to see the process of your work. What a FABULOUS little album Rebecca!! Congratulations ladies! Please email your information to sales@simplestories and we will get your prize packages out to you!! This week Simple Stories is teaming up with Epiphany Crafts for a week long blog hop. 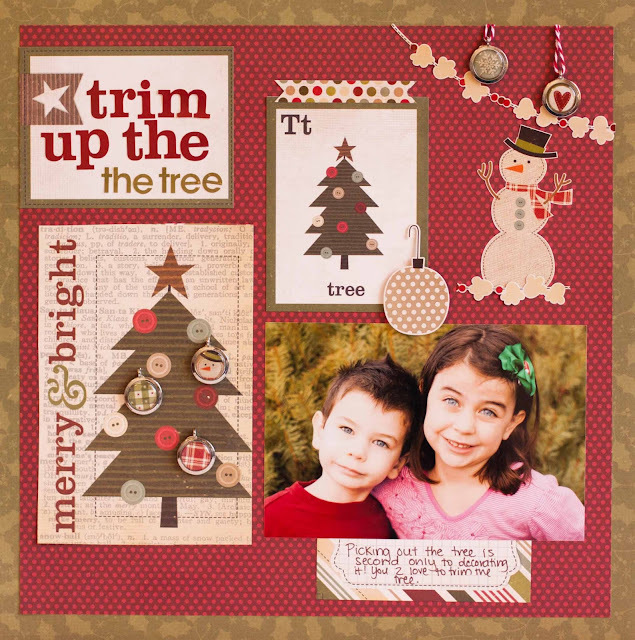 I was sent the Shape Studio Tool Scalloped Circle 25 to use, pair it up with Simple Stories Handmade Holiday and there is lots of fun to be had. My first project features something a little frosty...a cute little snowman treat bag. See his eyes? They were made using the Epiphany tool, those epoxy scalloped circles were perfect for this! For my second project I turned those epoxy scalloped circles into a trio of hanging ornaments. For the ornaments I used some of the little stickers from Handmade Holiday to embellish the centers before I adhered the epoxy scalloped circles. 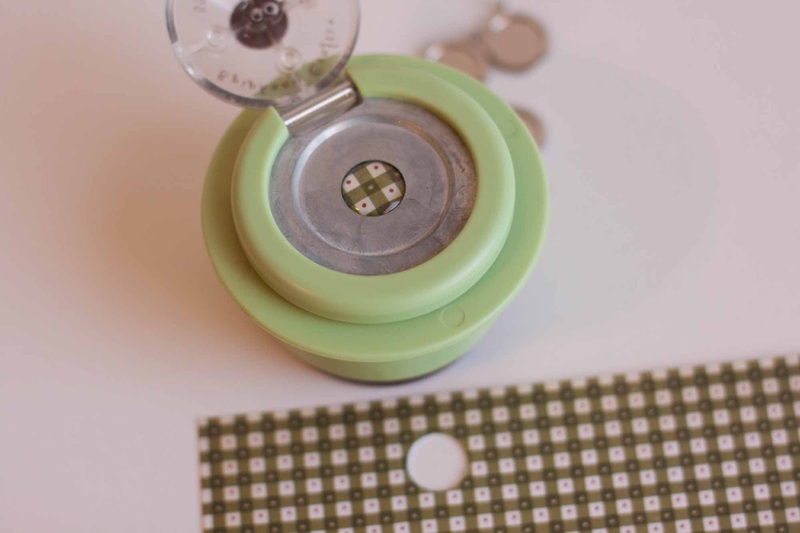 Love these tools from Epiphany, so easy to just insert your paper, insert the epoxy shape and punch them out together! Hey everyone! It's Emily Lanham here to share a really fun holiday mini album that I created with "Handmade HOliday" and my Epiphany Crafts shape studio round 14 tool! I love t ogive mini albums as gifts because bigger scrapbooks can take a long period of time to make andwith a smaller album, you can be more theme specific. For this mini album, I made the base out of empty toilet paper rolls. You really could never tell, right? Once they are painted, no one really would know that this adorable little mini book was made from tp rolls. I love using toilet paper rolls for mini albums. Since they have open ends, they are perfect for adding tags to slide in! The round 14 tool from Epiphany Crafts is one of my favorites. This little tool is so versatile! 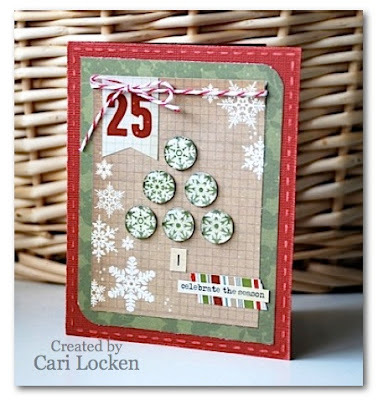 I used it ont my project to punch buttons from the Handmade Holiday FUndamentals Cardstock sticker sheet. 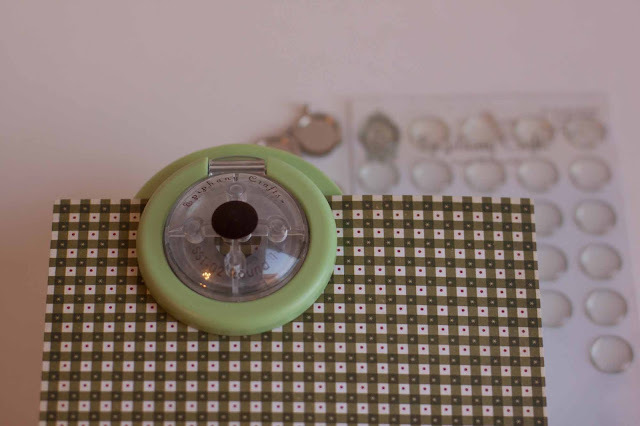 These buttons made the perfect centers for my flowers and also can be used in many other ways! Thanks for stopping by! I hope I was able to inspire you with a new gift idea this year! Make sure to stop by everyday this week on both our Simple Stories Blog and the Epiphany Crafts blog to see all the fun things that our design teams have created with Simple Stories and Epiphany Crafts products! More Fun with Handmade Holiday! I used a SVG file for the shadow box, and the rest is made out of Handmade Holiday (with the exception of the face of the shadow box it's 25 days of Christmas). I added a few buttons, burlap and some stars too. The possibilitys are endless on how you decorate the inside of the shadow box with Handmade Holiday. The 4x6 Journaling Cards and 4x4 Quote Elements fit perfect in the shadow box. And the Cardstock stickers are so cute! Happy Thanksgiving everyone! Donna here today, and I'm excited to be your host for the blog on this special day. Today I'd like to share a few cards I made using Handmade Holiday. Maybe it is because I live somewhere where there is no snow, but it has made me a bit obsessed with snowflakes. They are just so pretty, especially when layered with a doily and a contrasting star. The next card I made features stickers from Handmade Holiday. Simple Stories makes the best sticker sheets, don't they? 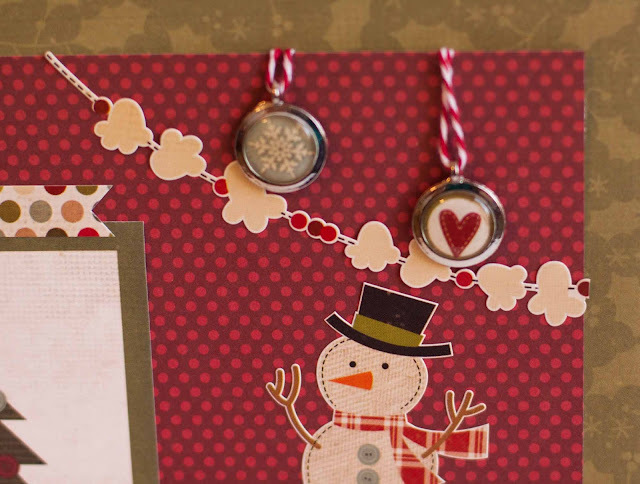 They make embellishing a page or a card so easy. Handmade Holiday has three coordinating sticker sheets. For this next card, I used a couple of stickers from the Fundamentals Cardstock Sticker sheet. And for the first time ever, I heat embossed on a sticker! I was a little nervous about how it would turn out, but it was actually very easy and came out quite well. I had so much fun using that "merry merry" stamp, that I used it again to make this very simple card. Notice the snowflakes, again. Like I said, I'm just a tad obsessed. I hope you've enjoyed today's post. Thank you so much for stopping by, and spending time with me on this happy Thanksgiving Day!! It's the day before Thanksgiving and I can envision many of you busy at home in your kitchens, baking pies and rolls, decorating the table, and getting ready for company tomorrow. 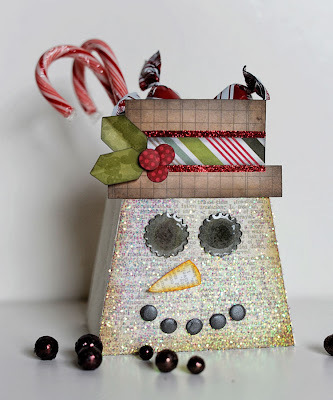 Christmas will follow quickly thereafter, so today, I have a fun holiday decor project to share with you. 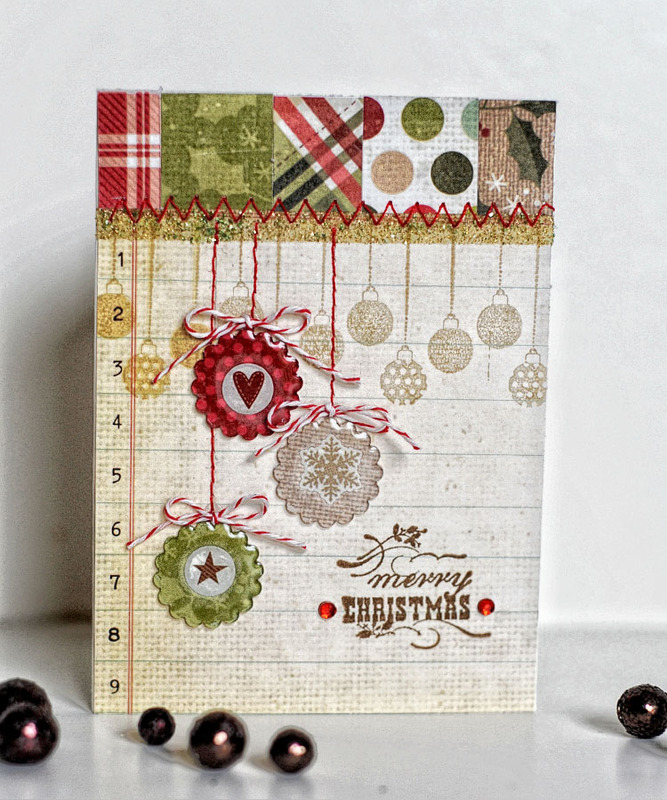 Handmade Holiday certainly makes creating for the holidays fun and effortless. All it takes is a little imagination and before you know it, you're done! I created a quick banner mixing in elements from Handmade Holiday with paper from the Documented collection as I wanted a little pop of black. I also used a few cardstock stickers from the Year.o.graphy collection and mixed in felt die cuts, flair buttons, vintage trim, baker's twine, scrunched seam binding, and buttons. 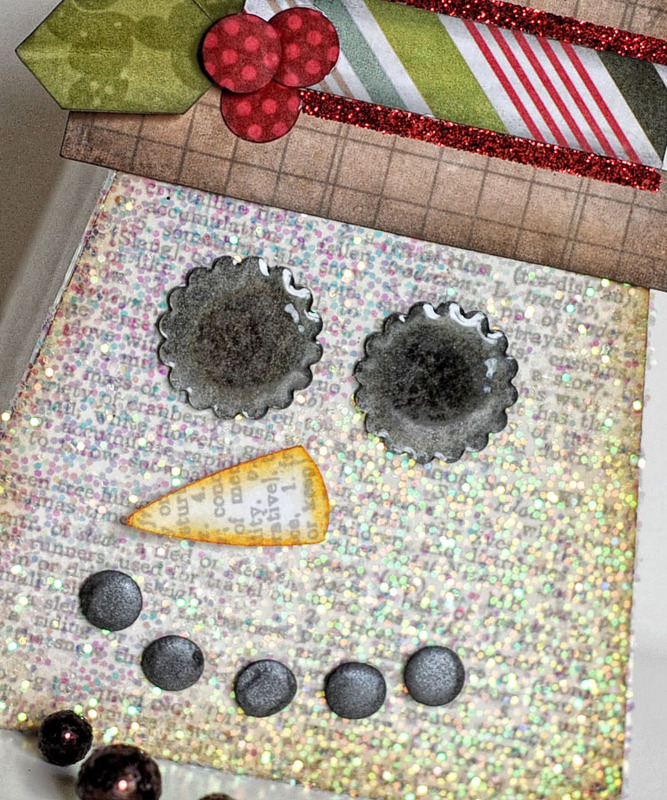 The best part is I have oodles of scraps and bits leftover just the right size for holiday cards. Hi all! Kay here with a few layouts using the Sn@p line. Man, these colors make me HAPPY!!! The first is a simple 8.5 x 11 page. 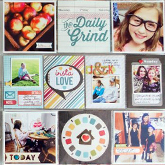 I just love how quickly you can pull together these products to make a fun, happy page!